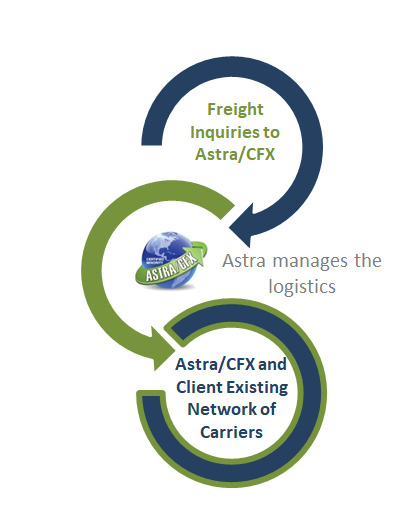 Astra/CFX Holdings subsidiary Astra Supply Chain focuses solely on Logistics. Allow our years of experience, knowledge, and carrier relationships benefit you in providing a centralized logistics management solution.We would design a customized logistics workflow focusing on utilizingexistingAstra assets, relationships with best in class regional and nationwide carriers, and fully integrated web-based TMS.Our goal is to reduce transit time and provide measurable savings over you existing total logistics spend. Astra to add assets to high volume lanes specifically to supportyour point to point distribution. Why outsource your Logistics spend? Contact Us to see what freight transportation options you have at your immediate disposal.